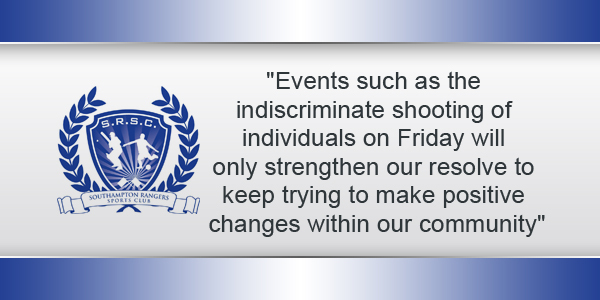 Their statement follows after two people, a male and female, were injured in a shooting on Friday evening when two men on a motorcycle rode into the parking area of the club and discharged a firearm. As a result, a 36-year-old female and a 33-year-old man were shot, both were conveyed to hospital and treated for non-life-threatening injuries and released. A statement from the Southampton Rangers Sports Club Executive said, “On behalf of the entire Southampton Rangers Executive and Members we would like to send our best wishes and prayers out to the two members of the community that were injured on Friday evening. “We are indeed thankful that no serious injuries occurred as a result of this unprovoked and disturbing incident. “The Southampton Rangers Sports Club Executive and Members have worked tirelessly over the past year to instill a community atmosphere around the club inclusive to all. “Events such as the indiscriminate shooting of individuals on Friday October 6th will only strengthen our resolve to keep trying to make positive changes within our community. “Although we understand that the individuals involved in conducting this act do not come from our Southampton Rangers community directly, Bermuda as a whole must face this issue head on as an island community. “Within the past year Southampton Rangers Sports Club have managed to revive both our youth cricket and football programs with the help and support from its dedicated members. “Regular community fun days and work rallies have been held to restore and revive our club and community. “Such examples as the Re-Painting of the Clubhouse work rally held on April 8th, 2017; Senior’s Tea sponsored by Fairmont Southampton on June 22nd, 2017 which saw over 50 seniors enjoy the sounds of Mr. Shine Hayward; the Back to School Haircut Giveaway in collaboration with the Southampton Seven Day Adventist Church on September 10th, 2017 along with Southampton Rangers Senior Football Team Potluck held most recently on September 22nd, 2017 which sold over 250 plates to the community. “In addition to these events, the Club sponsors community barbecue’s on Fridays along with our senior’s raffle and dinner night every Thursday and will continue to be held. “The Executive would like to let the public know that we are doing our utmost to ensure that our premises are safe for all patrons and members. “After consultation with police months back, the club invested in new lighting systems for our parking lot along with a new camera operated buzzer door for entry into the building. More security cameras have been implemented as well, all prior to Friday’s incident. “The Executive will be meeting with all relevant officials and police again in the near future to reassess the suggestions that were put forth and implement any new suggestions. Until clubs like Rangers move away from the bar as the main driver of revenue, they will continue to attract anti-social persons. This will in turn attract violence. Gone are the days when sports clubs were members-only clubs. Now, anyone with $5 can patron these clubs. I’m afraid that liquor licenses will be taken from clubs (who do offer some social good to their communities) unless they show a serious willingness to stamp out anti-social elements. And that can’t happen as long as your clubs are watering holes and party venues. Sheesh, how many times have we seen that headline, or similar for the same reason involving that club? Maybe cutting taxpayer funding to them till they clean up their act might get the attention of the club administration. Zane wants to chuck more money at them. Of course. From your comment you can tell that you have never set foot inside of any sports club on the island. If you did you would realize that they get no government funding what so ever. When you say clean up their act? Are you referring to the young gentlemen from town that keep coming to this area and committing these acts. I dont think we have heard of any reprisal acts in town as a result of any of these incidents. So please clarify your comments on a situation you clearly have not bothered to do any research on. Who actually owns these clubs? 1. Haircuts, potlucks and Senior Teas are swell but they don’t mean JACK. Friday happened regardless of the haircuts and casseroles. 2. “Nobody saw nuthin’.” That is complete horse sh*t and we all know it. 3. This continued violence is absolutely NOT an “island-wide issue.” Pardon me, but it seems as though the problem belongs to said people who “didn’t see nuthin’.” Don’t expect the whole island to end this violence when the people directly involved as witnesses or targets won’t even help. Knock on THEIR doors for answers, not mine. Get real with this or accept it as the new normal. You are part of the problem if you can openly say that this is not an island wide problem. Kindly note that the incident from Friday night is not a retaliation from the members, frequenters or ‘family’ of Rangers. Lets discuss those ‘Nobody saw nuthin’.. I am positive those whom ride around the island dressed in dark clothes, tinted helmets and gloves, on unrecognised bikes are the reason ‘Nobody saw nuthin’. Lets knock on the doors of those who know their friends, boyfriends, maybe one of your cousins who think to do things like this. Or are those the ‘Nobody saw nuthin’. How about we talk about the violence and continuous gang culture surrounding all of Bermudas sports clubs/bars and lets go even further to discuss the culture who inhabit the backyard of the City of Hamilton who are the ones causing this drama in the first place. If “nobody saw nuthin” how do you know whose doors to knock on? Perhaps “somebody DID see sumthin”? Club need to have a zero tolerance period for anti social behaviour! Southampton Rangers Sports Club has -10 tolerance for antisocial behaviour..
Heard this before from them. Still waiting…. Should have started years ago when that fight involving a 2X4 and a machete that ended up on World Star. As a member of the Southampton/Warwick community I am happy to say that I feel the Preside of SRSC is doing an excellent job, I am also pleased with the members and with the people who frequent Rangers. You find their willingness to give back to a club with such a stigma and past, to be admirable. I am disappointed in Friday’s activities however am still open to tell anyone whom inquires that I feel as though SRSC is a community club and is on the track to moving forward. Please do not be discouraged, lets continue to work at what has been started and continue to give back to our neighbourhood. I advise those who comment such negatively in regards, to get involved or to be quiet, you are not helping. Every year the same ****. Rangers allows anyone in that’s why they can’t figure out who comes up there n commits these senseless acts. Shooting into a crows of ppl makes zero sense unless you’re a terrorist. Without knowing the considerable work that has gone into revitalizing the Rangers club many naysayers on this blog are simply doing what they do worse,i.e., posting ignorant comments. I am not a member of SRSC however I am a former player, coach and administrator of a few local clubs. It is from this vantage point that I can comfortably say that massive improvements have been made at Rangers over the past year. It is unfortunate that this recent act of violence threatens to undermine those efforts. It is equally unfortunate that many on this blog and in the general population immediately cast blame without fully understanding what they are commenting on. They say this every time a shooting happens at this club…..where are the cameras, and witnesses? I would just like to say coming from a young persons view.How are the club’s supposed to stop what’s going on when as soon as they try they are being penalized for it.One example the one club owner who tried to kick out a gain member from entering his club, who got attacked by them after for not letting them in and yet his the one for being charged for attempted murder while guys attacked him first with wepons where was anybody to help him while he was fighting for his life.If we would have died can I ask what would have we done besides pray for his family? Ban bad people, talk to the police. Simple. Please correct me if I’m wrong but have all these incidents that have occurred at SRSC been on the actual grounds or from the parking area adjacent to the club? Because that area next to the club makes it vulnerable to these acts of gun violence and it gives the perpetrators easy access to get away. Maybe if they took that chain link fence down and replaced it with a wall (same height) and then restricted vehicular access onto the club grounds it may make things a bit more difficult for people engage in this type of antisocial behavior.